My favorite soap, ever….please do not drown it–get rid of superficial characters. I am begging TPTB to turn it around—Y&R has become as upside-down as GH. Mia, Carrie ( who has an agenda—-sensed it from the onset). …. decapitate them, I beg you!! ( not literally, LOL). What exactly are the writers doing with this woman Mia? Prove she’s a manipulating, psycho? Worse than Phyllis? I am so happy to see Michael be part of Salem’s living again. His resurrection merits mentioning—-a little more Lauren, please!! Oh, I’d love to see Paul take back what’s his—-the job Rey stole from him….. I wonder how many of the vets left on their own accord?! Celia, back in the 90s there was this hilarious comedian named Steven Wright who would deliver his monologues in a monotone (think if Eeyore were a comedian). I recall Wright saying,”I lost my job. Well, I didn’t really lose it. It’s just that when I went there someone else sitting at my desk.” That’s Paul talking about Rey! And how odd is it that not one character asks,”Where’s Paul?” He just vanished with nary a mention of it. I still cannot get over it. How are the new writers going to remedy this I wonder? I agree with your every word. Kerry should be recast–the character might work if played by a seasoned professional. This actress is too young, too wooden and just not very good. Mia?I don’t enjoy hating her. Do we really need another horrible shrew when we have Phyllis? Speaking of whom, yesterday she was boasting to Nick that she was the only one out of the four who kept a cool and collective head after Nikki killed JT. She said she has always been the one standing between Nikki and prison. I keep waiting for someone to tell her it’s just the opposite! Her handling of the situation was idiotic at best. There is no way Nikki would have gone to prison for accidentally killing JT while trying to protect her daughter. If anything, Phyllis insured that Nikki and the rest of them would indeed go to prison due to to the cover up, the burial of the body, lying to the police, etc. Listen, I don’t mind a control freak as long as they know what they’re doing. Phyllis is a confused control freak who turned this JT story line into an endless, frustrating bore of a story. No pun intended, bu this JT story line was dead upon arrival and they keep beating it like a dead horse. If you remember, you and I did comment on this very thing. The writers made the worst faux-pas I can remember…….but, for the sake of a storyline ( an insipid one at that), the “penners” decided to tell the viewer that Nikki had, indeed, committed a crime. No one believed it—-we are a smart, wise bunch….aren’t we, Harry? As you so eloquently said; it was just the opposite. The crime was perpetrated by JT, not Nikki, who did what any mother, human being with a healthy compos mentis would have done. Phyllis turned it into a crime by not calling the police and by hiding the body—-now, it has become a vicious circle. Are there two JT’s—whatever the answer, you’re right. This story has had no legs from the onset. 1989 – 30 years ago ! Oh, Patrick!!!!!! I am so saddened by what seems to be the disintegration, little by little, of Y&R……these writers are categorically murdering the show. Why give Mia all this importance? And why the sudden engagement of Abby and Arturo? Are these stupid, unappealing characters ( Mia, and Arturo, that is) trying to outdo each other? Who cares? And, why would Devon foot the bill for people he barely knows—or does not know altogether?…..an asine reception? Exactly what is the relevance of these people? Am I the only one who could give two hoots about these interlopers? ……. When I saw the nondescript, bland Mia appear in a wedding gown walking towards “the love of her lfe”? ( yeah, right)….. I completely FF-ed. I do not see this extraordinary beauty. She is not even pretty. Hard-looking…..However, when one’s personally is such that attracts; such that endears; such that is becoming; beauty takes second place. Mia has neither beauty nor personality. Please do not condemn me for holding so much resentment and antipathy towards the Rosales’. It suc*s!! Why did we need to see this? I am hoping that Arturo will succumb to his baser needs for this, tactless, unsavory, ordinary, vapid she-devil…..picture this; In walk Abby and Rey!!! Ahhhhh—-poetic justice!! The same goes for Carey? Corey?—-Jack’s infant paramour. She has an agenda. Mia’s ego is as big as her head!! Lola? What a big difference. So very classy…..natural;, without artifice. Patrick and Celia, I winced when Devon told his sister that Mia reminded him of Hillary. I think my face is still stuck in that wincing position. Ahhhh, Harry….Hilary is incomparable —-second to none….especially Mia. I will not apologize for the mess that is this actress and character. …..bad role, worse acting. She does not need a husband …..she needs a super-duper shrink!! Rey needs a super-duper alarm clock!! Arturo needs a super-duper lose-your-accent challenge. Harry, my friend….What else can we expect super-duper weenie, Devon, to say?? A super-duper empty remark!! 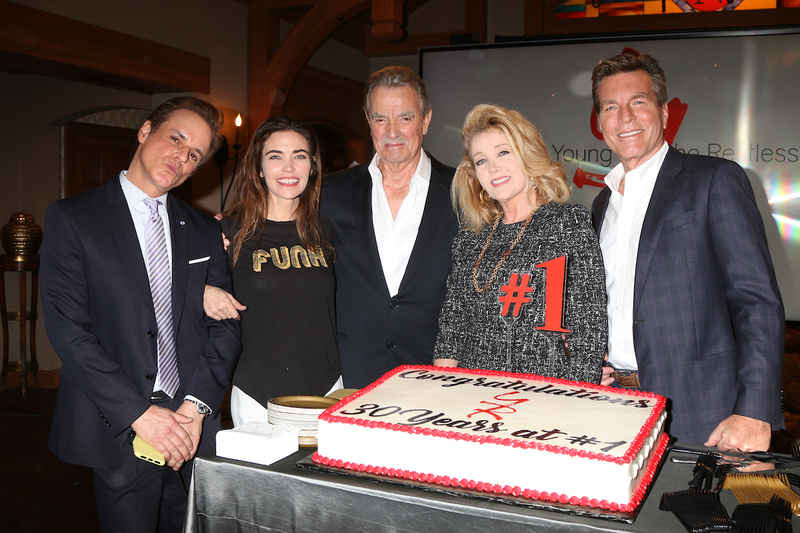 Nobody wants to see pics of the Rosales family – they have NOTHING to do with the successful run of “Y & R”!!! Hopefully Josh Griffith can get them outta GC ASAP!!! But I do love Lola. She is so good with Kyle. And I would not mind Rey sans Mia. I hope they bring back Paul as police commissioner and he can partner up with Rey. Paul is really good at police/detective bromances and it would be nice to see him in action again.